Our doctors are experienced in many types of surgeries and procedures. Advanced dentistry, soft tissue, laser, and orthopedic surgical services are some of these. We are proud to offer laparoscopic surgery services as well. It is our goal for each patient to have the safest, most stress-free experience possible. We follow the American Animal Hospital Association's highest surgical standards for the safety and comfort of your pet. We understand your concerns about your pet undergoing surgery. We hope to provide comfort to you by explaining some of our standards of care and are here to answer any questions you may have. We do preoperative exams and blood testing on every patient to ascertain there are no underlying issues with organ function, blood imbalances, or anemia that could cause complications. Your pet's past anesthetic history, breed, pre-existing conditions, and age are also factors used to determine your pet's personalized anesthesia protocol. Our use of the highest-grade anesthesia combined with intravenous fluids on every patient helps ensure the safest possible procedure. It is our commitment to provide personalized, minute-by-minute monitoring for each patient. 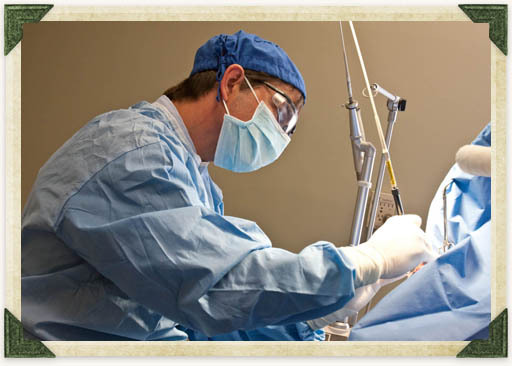 We use specially trained technicians alongside our surgeons to effectively monitor anesthesia during every operation. This technician monitors the pet's respiration, blood pressure, temperature, anesthetic depth, oxygen saturation, and heart function through EKG. Intense monitoring and comprehensive pain control before, during, and after surgery make for the most comfortable recovery for your pet. Each patient receives individual nursing care during their recovery to ensure they wake safely and comfortably with their nurse. Not only does pain hurt, it can also slow healing, decrease activity, and cause behavioral changes such as aggression, anxiety, and depression. We are dedicated to take steps to help your pet have the fastest, most comfortable post-operative experience possible. We use the best, safest medications available. Acupuncture can also be used as a part of pain management for your loved one.